This is a Black Capped Chickadee -- one of several that have begun to frequent the sack of thistle seed I hung on the shepherd's hook that had held the hummingbird feeder up until a couple of weeks ago when it became apparent that most (though not quite all) of the hummers had left for warmer temps in the south. 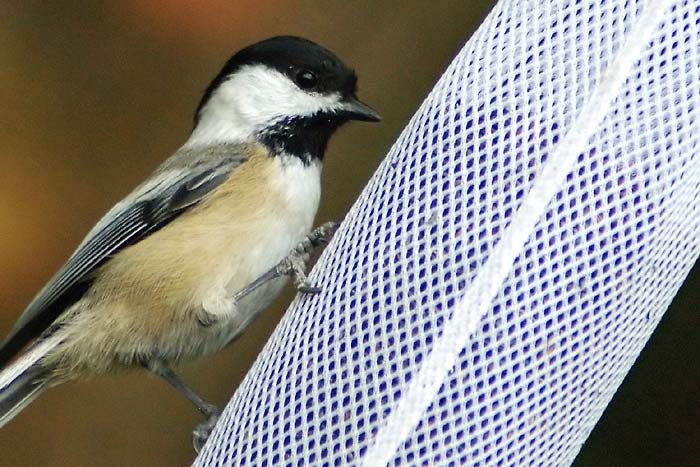 The Chickadees have noticed the sack and are happily in abundance for a short period each afternoon. Hopefully, they'll be joined by some of the finches for which the sack was purchased and I'll be able to get some shots of both varieties before the hummers return in the spring and I have to decide what hangs where. Decisions, decisions . . .